Last year Facebook rolled out a feature which gave many people the creeps. From that point on you could get a suggestion from Facebook if you had put up a picture with a friend in it. The suggestion was that you would tag that friend. The creepy part was that Facebook already had recognized the friend and had the tag ready to go. It lead to some pretty big discussions left and right about whether or not Facebook should do this. Especially the fact that it was an opt-out feature was important here. At that time Google already mentioned they too knew how to do face-recognition, but they were hesitant to use it, because of privacy issues. Google has now waited an appropriate amount of time since the Facebook discussions and has decided to go and use the technology. But in a ‘good’ way. Google last week announced two new features which make use of the face-recognition technology. One is used in Android, the other on Google+. “So today we’re launching Find My Face, an easier way to tag photos of yourself and your friends. It is a feature very similar to what Facebook was doing. The biggest difference is that Google got around the privacy issues by making the feature opt-in in stead of opt out. The Find My Face function doesn’t do anything if you haven’t turned it on, which will prevent automatically being tagged if you haven’t touched your settings. 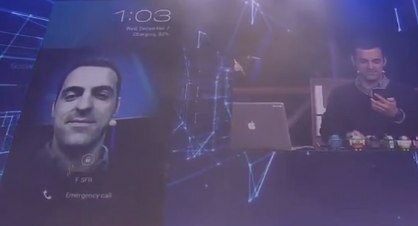 On the same day last week Steiner’s colleague Hugo Barra, the product management director for Android, took the stage at LeWeb in Paris (find a video of that later on today on State of Search) together with Eric Schmidt. He there showed the features of the Ice Cream Sandwich (Android 4.0) platform on the Samsung Nexus S smartphone. One feature there was unlocking the phone with face-recognition. The phone will recognize your face and thus unlock the home screen. Yet another move from Google to make things more personal and to make sure it is you who they are dealing with, not somebody else. 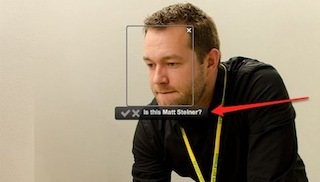 Again this is the face-recognition technology which Google has had lying around for a while now. I am sure we will see more of this in the near future.